The general election: it’s the climate, stupid? If the last three months are anything to go by, the main battlegrounds for the general election will be the economy and the personality of the party leaders. But that doesn’t mean that climate change will necessarily be sidelined. In previous elections, the climate hasn’t figured in any meaningful way. Yet, the polls suggest that it has the potential to play a bigger part in this election than it has in any previously. And while for Labour and the Lib Dems the climate presents an opportunity, for the Tories it could expose a damaging fault-line in the party. Even with the prominence of the economy, and despite recent stories challenging the science, climate change is an important issue for a large part of the electorate. It remains widely accepted as fact: 91% still think it’s a reality at least to some extent, and a YouGov/Left Foot Forward poll in December found that nearly 1 in 5 see it as one of the three or four most important issues facing the country. An ICM poll for the Guardian in August last year found that for 6%, the environment will be the most important issue in their decision on how to vote. This might not sound like much – just over 1 in 20 – and indeed it puts the environment as only the seventh most important issue overall. But 6% will go a long way in an election that’s as close as this one. To put it in context, the top 111 target seats for the Tories need a swing of 6% or less to go blue, while the Lib Dems would gain 43 seats with a swing of the same amount. Of course it doesn’t work quite like that in practice – and that’s where things start to get complicated, particularly for the Tories. That 6% whose vote is most influenced by the environment already have their party preferences. According to the ICM data, about a third of them would vote Lib Dem, 30% Tory, and 11% Labour; the rest would vote for another party. This Tory lead over Labour is a bit surprising, as other polls suggest that Labour voters are usually somewhere between Lib Dems and Tories in enthusiasm for tackling climate change. 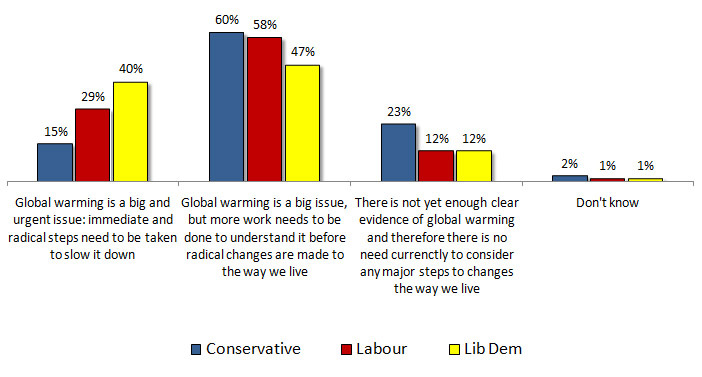 For example, the Left Foot Forward December poll shows that 31% of Lib Dem voters say the environment is one of the most important issues facing the country, followed by 23% of Labour voters, and 10% of Tory voters. The explanation for the ICM numbers is probably a combination of a low base size for this particular sub-group, and Labour’s support being at an unusually low ebb when the poll was conducted; since it was published, the Tory lead in ICM’s polls has shrunk by 9pts. Nonetheless, it’s clear that both the Tories and Labour have less support than the Lib Dems do among those who care most about the environment. This is reflected in polls that ask which party is seen to have the best policies on various issues. As we’ve seen before, this is the only issue tested in which no single party dominates. In a new ICM poll for the News of the World, the parties are roughly tied on around 22% for having the best policies on the environment. This has a different significance for each of the main parties. For the Lib Dems, the environment is easily their strongest issue: their next strongest is “setting taxes”, on which only 11% see them as having the best policies. They have also gained ground relatively against the Tories since August last year: they previously trailed by 3pts, now they lead by 2pts. As we have seen, the environment is a key part of the Lib Dems’ appeal to their voters, and is an issue they cannot afford to lose ground on, and might benefit from continuing to push. For Labour, the failure to dominate the issue might be seen as disappointing – but also could be an opportunity. Compared with the other eight issues tested, it is seen to be Labour’s second-weakest, perhaps despite the energy and climate change legislation passed in this parliament. Over the next few weeks, Labour could gain some support, and stand to lose little by making it an election issue. As we have seen, the environment is a key appeal of the Lib Dems; Labour could take the sting out of this by improving perceptions of their own credentials. Equally, it doesn’t look to be much of a potential vote loser for Labour: only 12% of their voters say there’s no need currently to consider any major steps to tackle climate change, compared with 29% who say it requires “immediate and radical steps”. However, the biggest advantage for Labour may be in the damage it could do the Tories. Currently, the Tories are holding ground with the other parties in terms of environmental policies, even if it is seen to be their joint-weakest issue. Indeed, the August ICM poll shows that 5% of Tory voters say that the environment is the most important issue in their decision on how to vote. For the party to be able to form the government, it needs to win a lot of seats from Labour. To do this, it’s going to have to get large numbers of Lib Dem voters to switch to the Tories, or at least not to vote tactically for Labour. This will be a lot easier if the Tories can persuade those voters that the environment will be safe in Conservative hands. But weighing against this are the attitudes of significant proportions of Tory voters and PPCs. The Conservatives are the only party whose voters are more likely to say that there’s no need currently to consider any major steps to tackle climate change, rather than that immediate and radical action is necessary. A quarter of Tory voters don’t see it as a big issue at the moment, with only 15% seeing it as urgent. Along similar lines, a poll of Tory candidates in January put reducing Britain’s carbon footprint as their lowest priority. It will be a tough course for the party leadership to steer: keeping its core support at both grassroots- and parliamentary-level, while also winning more environmentally concerned votes from other parties. Given the level of anger in sections of the party (enthusiastically expressed here, for example) about Cameron’s “Vote blue, go green” message, my guess is that the Tories will attempt to keep away from climate change during the election, for fear of it becoming an issue that risks severing the base from the leadership. Should the other parties fancy some mischief-making, they might well benefit from doing the opposite. This entry was posted on Monday, March 15th, 2010 at 23:50	and is filed under Climate Sock, Politics. You can follow any responses to this entry through the RSS 2.0 feed. Both comments and pings are currently closed.